Sam Evison of Bourne batting against Market Deeping. Bourrne, the Lincolnshire champions, tackle West Indian Cavaliers (Notts) in a semi-final with the winners playing in a final straight afterwards. James Hook bowling for Market Deeping against Bourne. Third-placed Bourne will attempt to get their Lincs Premier Division title challenge back on track tomorrow (August 5) when hosting Woodhall Spa. Bourne were crushed by nine wickets by neighbours Market Deeping last weekend. Deeping are at Boston tomorrow. Second-placed Ramsey, fresh from becoming the first Cambs Division One club last weekend to topple Ketton last weekend, entertain third-placed Ramsey. (Noon) Premier Division - Horton House v Peterborough Town, Oundle v Finedon. (1pm) Division Two - Peterborough Town 2nds v Great Houghton. (1pm) Division Three - Great Oakley v Oundle 2nds. (1pm) Division Eight - St Michaels v Oundle 3rds. (Noon) - Boston v Market Deeping, Bourne v Woodhall Spa, Bracebridge Heath v Spalding. (12.30pm) Division One - Histon v March, Ketton v Nassington, Ramsey v Wisbech. (12.30pm) Division Two - Castor v Kimbolton, Saffron Walden v Ufford Park. (1pm) Premier Division - Market Deeping 2nds v Spalding 2nds, Woodhall Spa 2nds v Bourne 2nds. (1pm) Division One - Skegness 2nds v Long Sutton, Timberlands v Moulton Harrox, Welby Cavaliers v Baston. (1pm) Division Two - Heckington v Long Sutton 2nds. 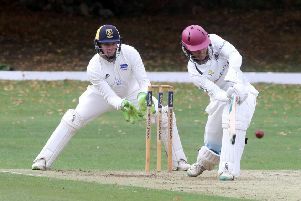 (1pm) Division One - Burghley Park v Ramsey 2nds, Hampton v Eaton Socon 2nds, Newborough v Orton Park, Southill Park v AK 11, Waresley 2nds v Stamford. (1pm) Division Two - Barnack v Buckden, Bharat Sports v Ickwell, Nassington 2nds v Peterborough Town 3rds. (1pm) Division Three - Biggleswade v Burghley Park 2nds, Orton Park 2nds v Ramsey 3rds, Sawtry v Upwood. (1pm) Division Four - Blunham 3rds v Ketton 2nds, Brampton v Castor 2nds, Ickwell 2nds v Bretton, Kimbolton 2nds v Newborough 2nds, King’s Keys v Hemingford Park, Little Paxton v Werrington. National T20 - Bourne v West Indian Cavaliers (at Wellbeck CC). (1pm) Division One - Barnack v Wisbech, Grantham v Peterborough Town, Ketton v Market Deeping, Nassington v Bourne, Stamford v Oundle. (1pm) Division Two - Castor v Weldon, March v Burghley Park, Newborough v Uppingham, Uffington v King’s Keys, Ufford Park v Whittlesey. (1pm) Division Three West - Medbourne v Finedon. (1pm) Division Three East - Long Sutton v Werrington. (1pm) Division Four East - Market Deeping 2nds v Uffington, Moulton Harrox v Castor 2nds, Spalding v Newborough 2nds, Whittlesey 2nds v Ufford Park 2nds. (1pm) Division Four West - Benefield v Barton Seagrave, Bourne 2nds v Peterborough Town 2nds, Huntingdon v Hampton 2nds, Sawtry v Weldon 2nds. (1pm) Division Two - Freiston v Pinchbeck. (1pm) Division Five - Addida v Buckden, Warboys v Sheikh 11.